In the year 2015, WHO and its member states agreed to adopt the Sustainable Development Goals, and also committed to adopt concrete steps to advance 'Health For All'. Such a pledge was taken to ensure that everyone, everywhere can access essential quality health services without facing financial hardship. Building on the Millennium Development Goals, the UN 2030 Agenda for Sustainable Development has drawn 17 Sustainable Development Goals and 169 targets. Trying to achieve what the MDG failed to achieve, it strives to realize human rights for all and to achieve gender equality and the empowerment of all women and girls. It especially seeks the promotion and protection of social, economic and environmental dimensions of sustainable development and access to basic health care. The Agenda provides for strong political commitment to public health: "To promote physical and mental health and well-being, and to extend life expectancy for all, we must achieve universal health coverage and access to quality health care. No one must be left behind" (Agenda 2030, Para 26). India, being a part of the global community, has always been active in achieving the global mandate, be it MDG's or SDG's. After formation of the Government in 2014, India's health policy has been transformed with major changes. It has gradually increased the health budget of India. For example, total expenditure of Ministry of Health and Family Welfare was USD 14103 million in 2012-13, which became USD 21467 million in the year 2017-18. The present government is trying to fulfill its promise to people by improving the health infrastructure all over the country. In the last four years, the government has brought various health schemes to ensure health for all i.e. Rashtriya Swachhata Mission to end open defecation; New Health Policy in 2015, E-health initiative as part of Digital India Campaign along with special attention on health equipment production. In the recent budget, the government has adopted the world's largest universal health coverage scheme namely Ayushman Bharat Scheme. During the budget session 2018-19, Union Finance Minister Shri Arun Jaitley announced the Ayushman Bharat Scheme on 14th March, 2018. Later, the scheme was officially declared by Prime Minister Shri Narendra Modi on the occasion of Ambedkar Jayanti i.e. 14th April, 2018 at Bijapur District of Chhattisgarh. On this occasion, he stated "The Ayushman Bharat scheme is not limited to simply providing a service, but also invokes public participation so that we can create a healthy, capable and content New India," The Government is prepared to launch the scheme on 15th August 2018 in all States of India in one go. Ayushman Bharat Scheme or National Health Protection Mission will subsume the on-going two centrally sponsored schemes, Rashtriya Swasthya Bima Yojana (RSBY) and the Senior Citizen Health Insurance Scheme (SCHIS); Ayushman Bharat, has basically two core agendas to fulfill. First, it will establish a network of Health and Wellness Centers (HWC's) across the country to deliver comprehensive primary healthcare. These centers will provide free drugs and diagnostics services to all identified poor families. To ensure that nobody is left out, in tune of UN-SDG - No One Left Behind, (especially women, children and elderly), capping on family size and age has been removed from the scheme. Pre and post-hospitalization expenses will be covered under this scheme, which will include transport allowances too. Second, this scheme will be known as National Health Protection Scheme (NHPS). Ayushman Bharat or National Health Protection Scheme,will over 10 crore poor and vulnerable families (approximately 500 million beneficiaries) providing coverage upto 5 hundred thousand rupees per family per year for secondary and tertiary care hospitalization. This scheme is going to be the world's largest universal health coverage scheme. The entitlement of beneficiaries under this scheme will be based on Socio-Economic Caste Census (SECC) database. Beneficiaries from rural areas will be families having only one room with kucha walls and kucha roof (kucha means temporary); families having no adult member between age 16 to 59; female headed households with no adult male member between age 16 to 59; disabled member and no able bodied adult member in the family; SC/ST households; and landless households deriving major part of their income from manual casual labour, Families in rural areas having any one of the following will get automatically included: households without shelter, destitute, living on alms, manual scavenger families, primitive tribal groups, legally released bonded labour. For urban areas, 11 defined occupational categories are entitled under the scheme. Another major feature of this scheme is that the beneficiary will be able to avail the scheme both in public and empaneled private facilities. To keep the costs under control, the payments that will be made for the treatment of the beneficiaries will be done on package rates, which will be defined by the Government in advance. While strengthening and establishing the UNSDG, the core principle of the Ayushman Bharat scheme is to strengthen cooperative federalism and add operational flexibility to the states. There is provision to partner the States through co-alliance. This will ensure appropriate integration with the existing health insurance/ protection schemes of various Central Ministries/Departments and State Governments (at their own cost), State Governments will be allowed to expand AB-NHPM both horizontally and vertically. For the smooth operation of the scheme and for giving policy directions and fostering coordination between Centre and States, the Government has proposed to set up Ayushman Bharat National Health Protection Mission Council (AB-NHPMC) at the apex level which will be chaired by the Union Health and Family Welfare Minister. It is proposed to have an Ayushman Bharat National Health Protection Mission Governing Board (AB-NHPMGB) which will be jointly chaired by Secretary (HFW) and Member (Health), NITI Aayog with Financial Advisor, MoHFW, Additional Secretary & Mission Director, Ayushman Bharat National Health Protection Mission, MoHFW (AB-NHPM) and Joint Secretary (AB-NHPM), MoHFW as members. CEO, Ayushman Bharat - National Health Protection Mission will be the Member Secretary; State Secretaries of Health Department may also be members as per the requirement. At the State level, each State will have a State Health Agency (SHA). At the central level, Government will establish a new agency namely Ayushman Bharat National Health Protection Mission Agency (AB-NHPMA). It will be headed by a full time CEO of the level of Secretary/ Additional Secretary to the Government of India. State Health Agency (SHA) will give advice to all the governments of the State and Union Territories on the implementation process of the scheme. States and UT's are free to give power of execution and implementation to existing Trust/ Society/ Not for Profit Company/ State Nodal Agency (SNA) or set up a new entity. They can implement the scheme through insurance company, trust or societies. The expenditure incurred in premium payment will be shared between Central and State Governments in specified ratio as per Ministry of Finance guidelines in vogue. The expected premium will not be of more than Rs. 2000 per year per family. The expenses for the scheme will be jointly borne by Central (60%) and State governments (40%). The total expenditure will depend on actual market determined premium paid in States/ UTs where Ayushman Bharat - National Health Protection Mission will be implemented through insurance companies. In States/ UTs where the scheme will be implemented in Trust/ Society mode, the central share of funds will be provided based on actual expenditure or premium ceiling (whichever is lower) in the pre-determined ratio. The State has to contribute its matching share of grants within defined time frame. To ensure that the funds reach SHA on time, the transfer of funds from Central Government through Ayushman Bharat - National Health Protection Mission to State Health Agencies may be done through an escrow account directly. It is anticipated that in the first year of its implementation, a total cost of Rs. 100 billion will be incurred, of which Rs. 60 billion will come from Centre and the rest Rs. 40 billion will be borne by the States. Looking at the large base of beneficiaries, as well as in tune with the policy of 'Digital India', the Government has also decided to launch a robust, modular, scalable and interoperable IT platform, in partnership with the NITI Aayog, which will make the entire process paperless and cashless. 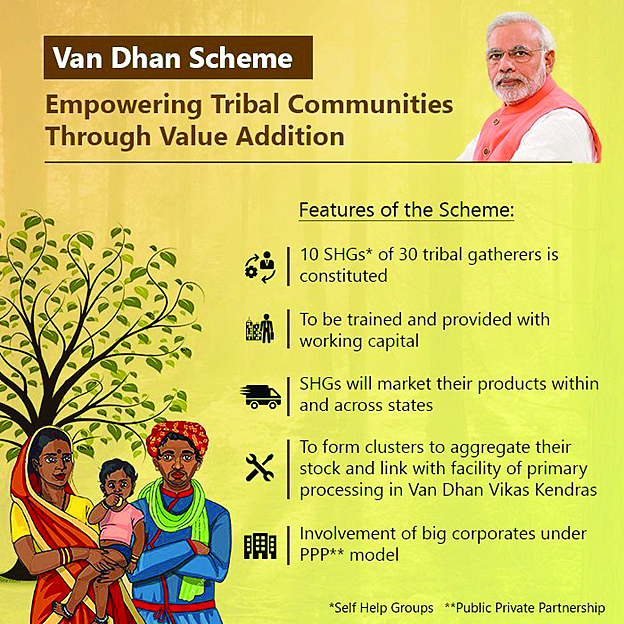 This scheme will enable the deprived sections of the population have increased access to quality health and medication. In addition, the needs of the population which had remained hidden due to lack of financial resources will be catered to. This will lead to timely treatments, improve-ments in health outcomes, patient satisfaction, improve-ment in productivity and efficiency, job creation thus leading to improvement in quality of life. The primary aim of the Ayushman Bharat Scheme is to inform, clarify, strengthen and prioritize the role of the Governments, centrally and state-wise, in shaping health systems for poor and vulnerable people of the country in all dimensions i.e. investment in health, organization and financing of healthcare services, prevention of diseases and promotion of good health through cross sectoral action, access to technologies, developing human resources, encouraging medical pluralism, building the knowledge base required for better health, financial protection strategies and regulation and progressive assurance for health. With AY-NHPS and related regulatory frameworks there is a sense of optimism that India will make Sustainable progress towards attaining "Health for All" and the SDG targets. The author is a Postdoctoral Fellow in International Institute for Global Health, United Nations University, Kuala Lumpur, Malaysia. email: shanteshjnu@gmail. com.